While I was doing piles and piles of laundry this weekend, I may have gotten sucked into a couple of Wizards of Waverly Place/Sonny With a Chance/Good Luck Charlie Disney Channel Marathons. I realize I’m out of their main target demo, but each of those shows have charming, witty or moving moments in them! It is not my fault that I think Selena Gomez and Bridget Mendler are adorable teens ok?! Avalon High looks a little cheesy, but also the most awesome non-musical Disney Channel Original Movie in a while (ah, how I miss the days of Brink and the original Halloweentown). It’s also based on a book by Meg Cabot, who is one of my favorite YA Authors. From the trailer, and my memory of the book (which I read when it came out) it’s basically a modern retelling/incorporation of the King Arthur mythology, and how it relates to high school. But has a lot of action and fun flashbacks to the medieval time these kids are descendants from. It’s only been one week since the season (series? *gulp*) finale of Life Unexpected and I’m already experiencing significant withdraw symptoms at the idea of no new episodes for an indefinite amount of time. With pretty much every show I watch on Monday nights (well, except for Lost, Glee, Flash Forward, Grey’s, Modern Family…I watch a lot of TV ok?!) or at least a large number of shows on Mondays, I was not looking to add yet another show to the lineup. As much as I enjoy Gossip Girl, and used to check up on One Tree Hill to see if it was still miraculously alive, they always seemed to get pushed to the bottom of my list, and then off it completely, until I maybe had time for a marathon event on a gloomy Saturday. 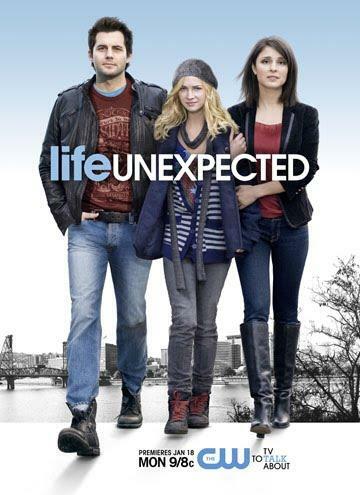 Life Unexpected shows up though, and suddenly I’m rearranging my whole TV schedule! Because the WB lives on in that show, and it makes me happy inside. It’s the story of a 16 year old girl (Lux) who seeks out her birth parents (Cate and Baze) so she can get emancipated from the foster care system. Obviously, things don’t go quite as planned, and suddenly Cate and Baze have joint custody of their daughter. Did I mention Cate is a radio host, is engaged to her co-host (Ryan), and that Baze owns a bar? Well, now I did. *Filled with uber-literate and self-aware teenagers. *I can’t describe it, but the sets and lighting scream late 90s teen soap. This is no shiny Gossip Girl/Vampire Diaries. Not that that’s a bad thing. *Serious parental drama, from both the teens and the adults-who-are-still-basically-teens. Though I guess in this regard, that’s pretty standard. *Catchy theme song. Again, not strictly WB-era, however lots of tv shows have pretty much eliminated a theme song in exchange for a few chords, so it’s a nice change of pace. This show better come back in the fall. Especially because they left it on a HUGE cliffhanger at Cate and Ryan’s wedding. When she KNEW that Baze had just burst in to admit that he really had feelings for her, even though he’d lied the night before! And Lux could’ve stopped it, but changed her mind, and now you KNOW she is kicking herself for not stopping the wedding when she had the chance. If I miss out on the ridiculously intense amount of family drama coming their way, I’m going to be really upset. You hear that, CW?? REALLY UPSET. So bring it back.